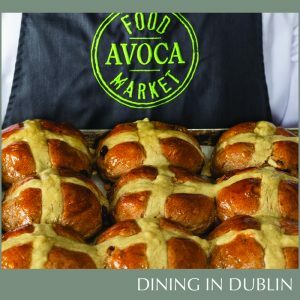 Hot Cross Buns are synonymous with Easter, so why not whip up a batch of your own with this fool-proof AVOCA recipe. Delicious both hot or cold, this recipe will keep you reaching for Hot Cross Buns well past Easter! Make a stiff but pipeable paste by mixing plain flour with a couple of teaspoons of cold water until smooth. Pre-heat your oven to 180 fan assisted. Start by dissolving the yeast in either 250ml of lukewarm water or milk along with the melted cooled butter. Place the flour, spices, salt and sugar into bowl of food mixer with the dough hook, mix on a low speed for one minute to incorporate ingredients. Slowly add the yeast liquid, add egg if using (this will give you a slightly richer dough) until the mix comes together. Then add the fruit and mix on a low speed for 5-8 minutes or until dough is springy to touch (it should hold a thumb indentation for a minute or two). If your mixture is sticky, simply add a little extra flour. Once your dough is ready, remove to a floured surface and divide into 10/12 equal size balls, approx. 100g in weight each. Roll each ball into a circle. If your mixture is sticky, simply add a little extra flour. Once your dough is ready, remove to a floured surface and divide into 10-12 equal balls approximately 100g in weight each. Roll each ball into a circle then place onto a parchment lined baking tray, allowing enough room for reach bun to double in size. Make a cross on top of each bun with your thick flour and water paste, you can pipe it on or use a teaspoon to drizzle it across. Allow the buns to rise in a cosy place which will take between 25-45 minutes depending on your kitchen’s temperature. Once they have risen, place in the hot pre-heated oven for 18-22 minutes or until golden and cooked through. Remove the buns from the oven and whilst still hot, brush with a little honey or golden syrup.